When it comes to personalised health care, people have more options than ever before. This has made the act of choosing a hospital for one’s care, something that is based not just on medical expertise, but on customer service and the quality of a patient’s stay. 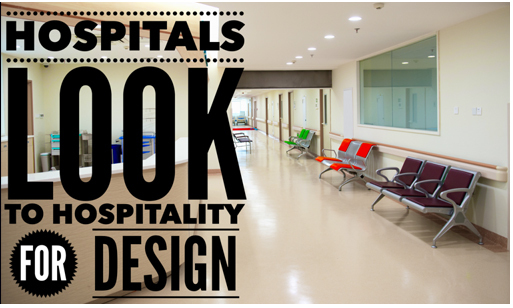 Which is why more and more, hospitals are turning to hospitality in their design approach. For many, the word hospital conjures up images of stale hallways, itchy chairs, fluorescent lighting, and a lingering smell that is associated with latex and processed air. This makes many people dread the hospital, and can impact a person’s decision to seek care. For inspiration, many hospitals have started reaching out to the hospitality industry to see how to make clients feel more at home. The result has been a complete makeover of everything, from the design of the buildings to the structure of the lobbies, to the style of the rooms themselves. Even the level of service provided by the hospital staff has changed. Now, cafeterias are stepping up their game, offering more exotic and better-prepared dishes, and hospitals are hiring more maids and attendees to assist clients alongside the already in-place nursing staff. One of the biggest trends has been to make the hospital room more like a guest room. Beds, while still meeting all medical standards, are now designed to look more like hotel room beds. Rooms are offering more features, better lighting, and more entertainment options. Many hospitals are calling in interior decorators to oversee how their space can be better geared towards a higher client satisfaction rating, and so far, it seems to be working. In Detroit, one hospital took to this new way of thinking, head-on. They’ve hired a staff versed in hotel management, and have completely redesigned their facility around things like natural lighting, better accommodations, and putting the patient 100% first with changes to visitation (now unlimited for all friends and family.) As a result, their facility has boomed in customers, and in kickbacks, and others are taking notice. The days of the depressing hospital ward are quickly drawing to a close. Nowadays, the patient is coming first, and the facilities are stepping up their game. As more and more facilities realize the money to be made by offering superior service and better accommodations, the patients will reap the benefits. Before long, your stay at a hospital will be just as relaxing and as accommodating as a stay at a luxury hotel, and for the rates the hospitals charge, would you expect anything less?